With the blessings of Hanumanji, Mahavir Mandir trust is adding grandeur to the temple by installing kanak kalashes (pinnacles) at the top of the two shikhars (spires). The kanak Kalashes have been made at Chennai by Tamil experts. The creation of the two kalashes cost the temple around 40 lakhs. 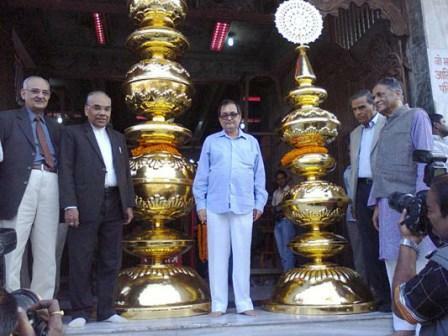 Now Mahavir Mandir, Patna adds glory to Bihar by having the largest Gold Kalash in the State. After ascertaining the credentials, cost effective transparent way of gold deposition with warranty over the gold deposition and recovery of gold even after many years of usage the Mandir committee entrusted the work to Chennai based gold coating company called “Smart Creations”. The big kalash weighs about 118 kg and the small one 70 kg. The total height of the big kalsah is 13 ft and that of Small kalash is 9 ft. The two kalashes have been made with the finest 18 gauge copper sheets. The work was done by about 10 artisans for 3 months done under the guidance of Shri Ravichandran (CEO of Smart Creations and Mr. Alawdeen who has experience of about 30 years in copper, silver and gold work. The team comes with Gold work experience with over 400 temples across the globe. In the process of gold deposition, Smart Creations has used special metal base coat to arrest the migration of gold into copper. Over the gold coated portion they have given a special lacquer coat which protects gold getting damaged due to atmosphere and change in climate. Smart Creations gives a warranty of over 50 years’ over the sheen of gold and also recovery of 95% of gold during the warranty period. According to the manager of Smart Creations Mr. Vinayak Venkatraman though the warranty is for fifty years the sheen will last for far longer than half a century. 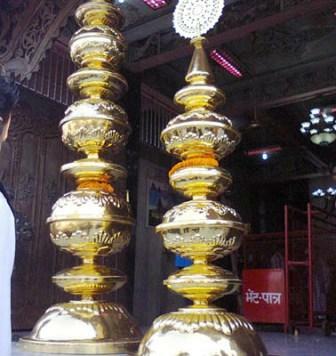 Acharya Kishore Kunal said that similar kalash will be installed at the top of the Simhadwar shortly. In addition, the Trust is cladding two existing Shikhars with the best quality of lakha red granites which have come from Banglore and whitest marbles which have come from Vietnam. Both the Shikhars will be illuminated with LED lights at night. In a period of two months the entire Shikhar will be an epitome of grandeur, glittering and illumination.